LebanAir is a privately owned FBO operating at the Lebanon State airport. Wherever you fly in from, you know that you will always be welcomed with a smile at LebanAir Aviation. We love our community, and we love flying and general aviation, and do our best to make your visit to S30 and Lebanon the most enjoyable one possible. On the pages of our website you will find information on the many services available here at LebanAir, as well as information about our community and the enjoyable things you can do once you get here. 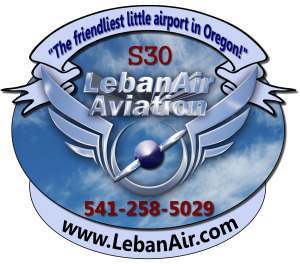 Whether you just want a friendly airport to fly to, or want to take part in the many activities that our community has to offer, you won’t be disappointed when you fly into S30 and visit LebanAir Aviation. We are close to great fishing on the Santiam River, two great golf courses, museums, parks, and a plethora of great restaurants, and more…all here for your enjoyment. And to top it off, we have courtesy cars available to out of town pilots free of charge! LebanAir has so much to offer the fly-in pilot, so please check out our links under “Pilot Services” — you will be glad you did. LebanAir Aviation is a Tecnam Service Center.